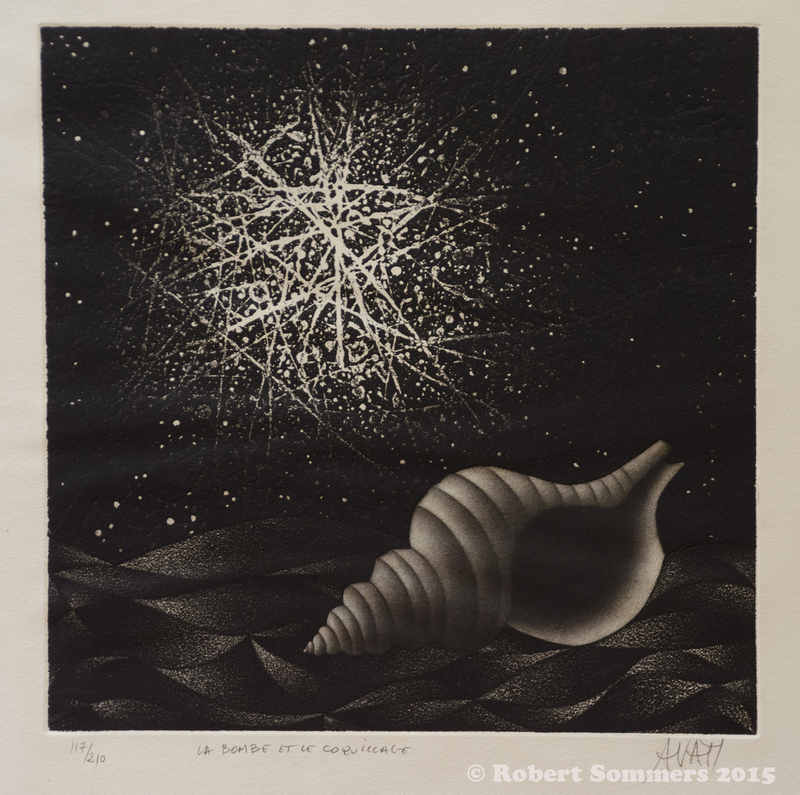 With the passing of Yozo Hamaguchi, Mario Avati stands alone as the foremost living mezzotint artist. In 2001 Fitch-Febvrel held a small retrospective to mark the artist’s 80th year, as well as the publication of Volume VII of a catalogue raisonné now spanning more than 50 years of printmaking. Mezzotint is among the most demanding mediums in art, one tried and quickly abandoned as “too difficult”, for example, by the great printmaker M.C. Escher. A copper plate is “rocked” with a curved, notched blade until the surface is entirely pitted. At this stage, an inked plate would print a rich, uniform black. The artist then uses a scraper or burnisher to flatten the raised parts, a little for dark grays, a lot for light grays, completely for white (after inking and wiping, the plate holds no ink where it is smooth). Colors are achieved by similarly working one or more supplementary plates. The result of this process is an image emerging from pitch black “nothingness” — a true analogue to Creation. Outlines are simplified by absence of line, while substance is rendered with a virtually infinite range of tonal subtlety. Avati’s mastery of the medium is most remarkable in his still lives, which convey both the volume and dimension of his subjects, combined with a sense of timelessness. Avati’s international stature is confirmed by numerous awards, documentary films made in Japan, the U.S., and Europe; over thirty solo exhibitions in museums and public institutions, and more than sixty gallery exhibitions worldwide. His works are included in more than 100 public collections including, along with some 40 French institutions, the Victoria & Albert (London), The Gemeente Museum (The Hague), Le Musée des Beaux-Arts (Brussels), Uffizi (Florence), Metropolitan & MOMA (New York), Art Institute of Chicago, Library of Congress & National Gallery (Washington, D.C.) inter al.